The Zebra G301 is one of my latest Zebra purchases. I seem to be building quite a collection of Zebras but considering they are sold in pretty much every stationery shop I visit it's inevitable that the size of my herd will increase. 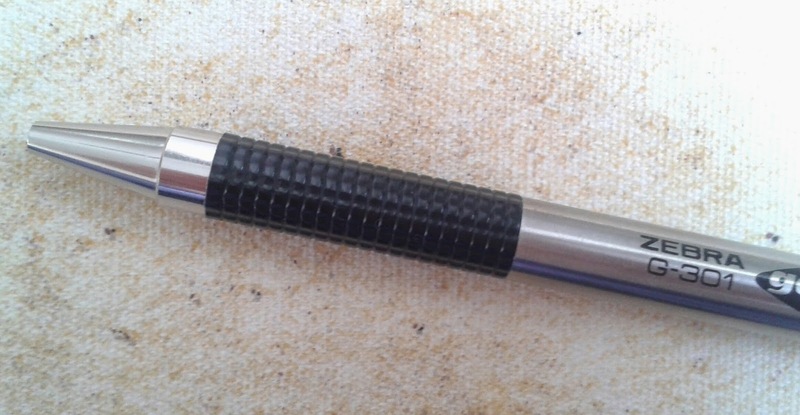 This Zebra has a stainless steel barrel and clip with a plastic ribbed grip. My first impression of the pen was that it looks clinical and cold. If it could talk I imagine it would give me a good telling off - what for I've no idea. When I saw the positioning of the grip I had to stop myself from letting out a sigh of despair. The Zebra G301 doesn't strike me as the kind of pen to tolerate whinging so I decided it was time to learn to adapt and overcome. Which I managed - almost. The grip let me down a little. I wanted to hold it on the grip, I really did but every single time I ended up sliding closer towards the tip and wind up half on and half off it again. For me it was a case of slippy, not grippy. Luckily the grip sits level with the body of the pen so together with the fact that the pen is light weight and evenly balanced it is still a comfortable pen to hold and use. I am totally in love with the ink in this pen. It feels exceptionally smooth on paper without being slippery, it flows perfectly, not a single hint of a false start or skipping and though the ink looks wet on paper it dries very quickly. Every single one of my notebooks has been compatible with the Zebra G301. The ink hasn't feathered or bled through the paper. I love it. It feels so good that I always manage to think of one more thing to write or doodle before putting it away. It's a bit like playing Mario - one more try at defeating Bowser turns into one final attempt, I mean it this time, just one more - next thing I know it's midnight and I have an early start in the morning. 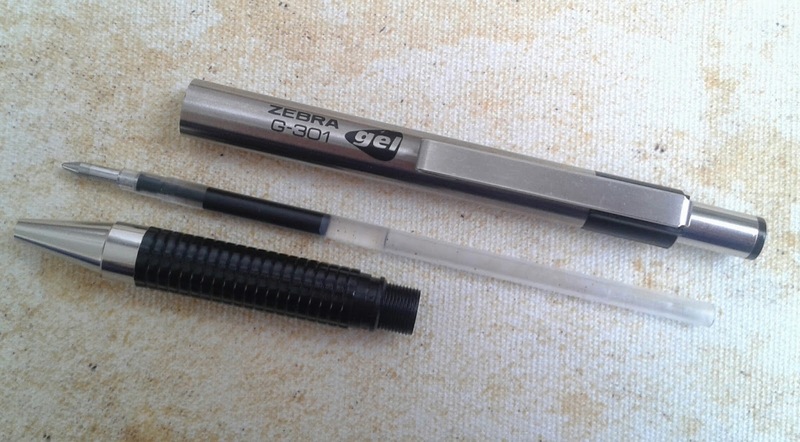 The Zebra G301 is refillable and uses JK refills. 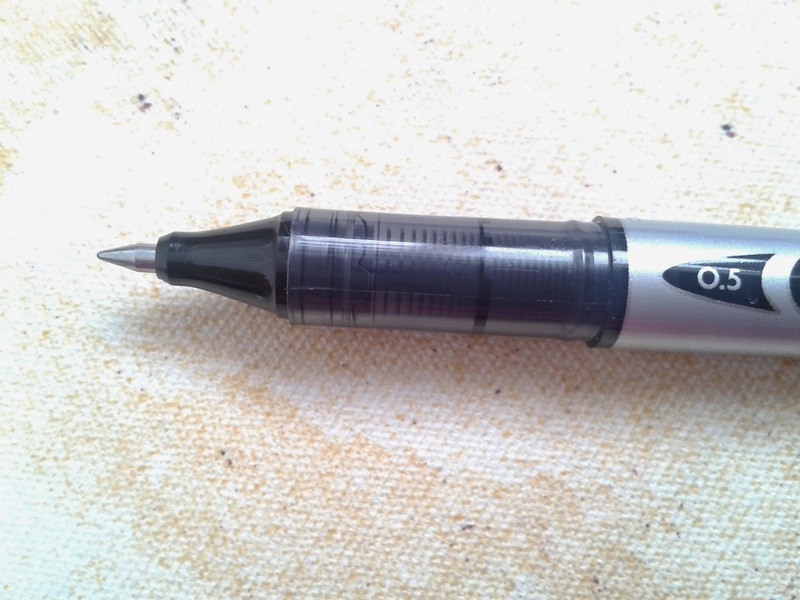 When I get a new pen one of the first things I look at is the refill and how to change it. I like to know how my pen works. On this occasion I unscrewed the pen and pulled out the refill (which was so hard to pull out that I actually worried I was doing it wrong or that maybe it wasn't supposed to come out after all) took a pic, but it all back together, pressed the clicky button, pressed it again, and again and realised I'd broken the pen. I seem to have damaged the spring so my pen is no longer a retractable pen. No amount of faffing about was able to fix it. So I'm a little cheesed off. If the pen tells me it's refillable then I'd expect to be able to refill it without the fear of damaging it so easily. The clip on the Zebra G301 is flexible and is easily clipped to thicker objects. Having said this I would still be careful as with a bit of movement the pen still moves about and did fall off when I shook my notebook. I know the shaking of notebooks isn't the norm but for me it's a good indicator of how reliable a clip will be under most circumstances. I know that if a pen stays put after a good shake the chances of losing it on any given non notebook shaking day is slim. 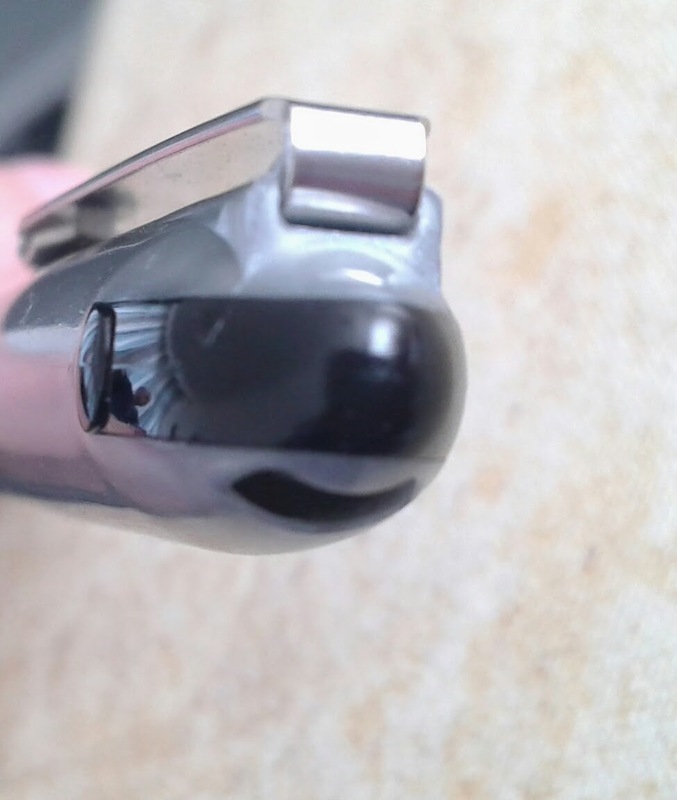 Many of my Zebra pens have Zebra written on the clip in some way or another and I am a fan of a bit of clip decoration so the plain clip on this pen only adds to my feeling of coldness. So my overall opinion of this pen - I love the way it writes. For the past week this has been the first pick from my pen pot every time. I've almost emptied the ink I've used it so much. I'm disappointed that I've broken it so zero points for being refillable as my pen didn't even survive one refill attempt. 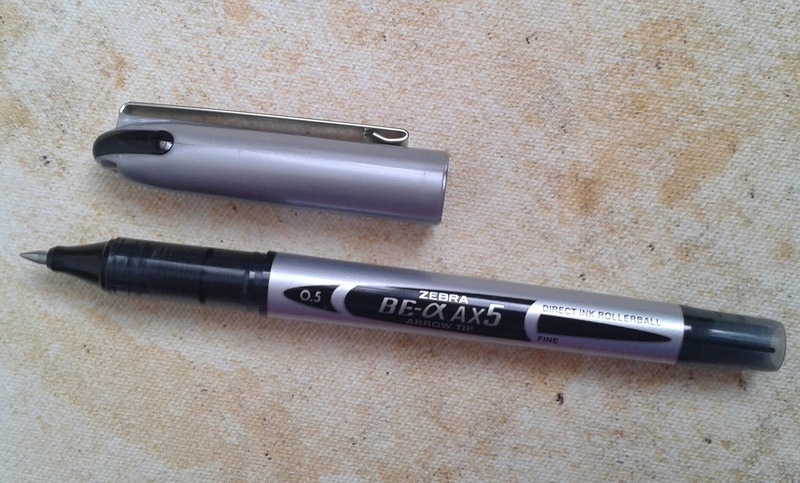 I'd recommend using extra care if you do choose to buy this pen with the intention of replenishing the ink. For me, how a pen feels on paper always overrides how I feel about it's appearance so given it's reasonable price I am tempted to risk buying another in order to have a fully functional Zebra G301 again but if it breaks again this pen will definitely be crossed off my Christmas card list. I won the May Ryman Blog Party! How are you all coping with the football madness that has gripped the world? Football isn't really my cup of tea and I'll be looking for ways to escape when it all gets too much. As someone who is never far from a pen and notebook I'm always looking for pens that help me improve on my handwriting. Handwriting practice is not just for school children. Adults can also benefit from a little practice now and then. I have spoken to so many people who type their work straight onto PCs, tablets and other devices and they tell me that when they find themselves with a pen in their hand it no longer feels natural and they realise that their handwriting isn't what it used to be. 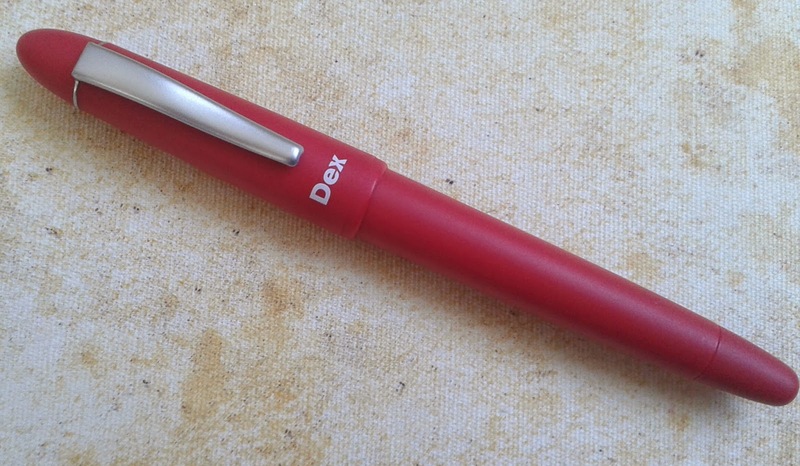 When I came across the Dex by Kingsley pen which claims to encourage correct grip along with confidence and enjoyment in handwriting I thought it was definitely worth looking at so I added it to my wish list. And now thanks to the very kind people at The Pen shop I have one. 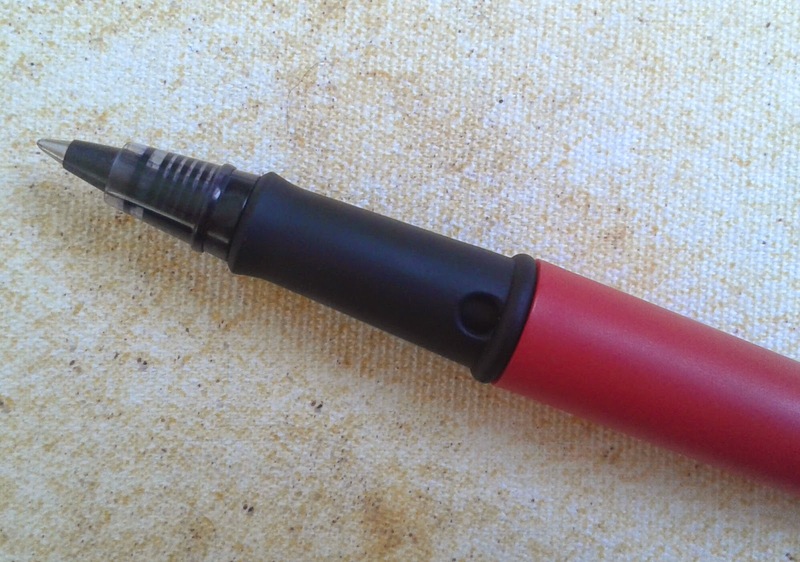 The pen is plastic with a metal clip and a soft touch grip. The Dex is so light to hold that I had complete freedom to move across the page, nothing was holding me back and the grip made such an easy task even easier. Sometimes even when a pen has a grip my fingers slip into an uncomfortable position but the contoured grip on this Dex makes slipping almost impossible. The grip flicks out slightly near the tip preventing my fingers from going any further. Each time I use this pen my fingers instantly snuggle into the grip as if it's where they belong. It's the same feeling I get when I sit on my side of the sofa that over time has moulded itself around my shape. Instant comfort and familiarity. To begin with I experienced quite a bit of intermittent skipping, even when I'd been writing for a while so I know the ink was given plenty of time to reach the nib. The ink would flow nicely for a while then skip like crazy for a few sentences then work fine again and so on. I tried altering the angle at which I was holding the pen and nothing seemed to make a difference. Just when I'd given up hope I tried one last thing - pressing harder onto the paper. It worked. The ink flow was much more consistent. The pen just needed a firmer hand. The fact that it's light and comfortable made me think I could loosely hold the pen and let it do all the work for me. I'd become lazy. I'm pleased the Dex had pointed out my laziness as I found myself slowing down and concentrating more on my grip, pressure and neatness, creating much neater handwriting. 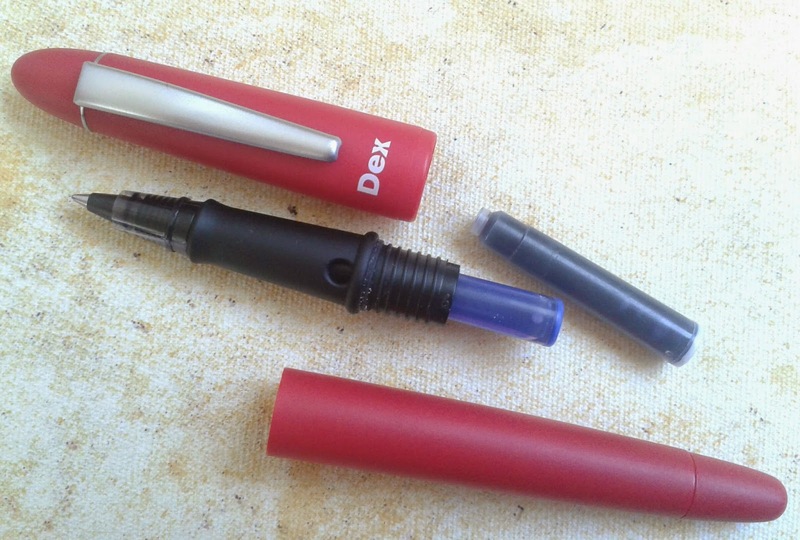 The Dex pen uses Dex ink cartridges which instantly transported me back to being 11 on my first day of secondary school with my brand new fountain pen and stash of cartridges in my pencil case. I haven't used a fountain pen for years, I much prefer the simplicity of a rollerball but if fountain pens are your thing then the Dex by Kingsley can also be purchased as a fountain pen and is available in a range of colours. The cartridge is so easy to fit. The pen stores 2 cartridges, one spare and one to use. Place the spare in the barrel, narrow end first and then place the one you will use on top of it, narrow end up. 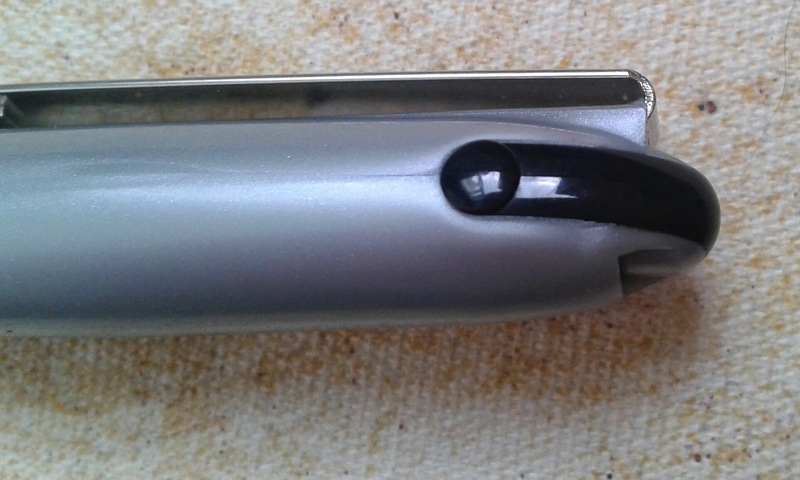 When you screw the pen back together the top cartridge will be pierced and in place, ready to write. No more double checking to see if the cartridge is secure. It's a fool proof method. There is a little peep hole on the grip so I can keep an eye on my ink usage. It will take me about a week to empty one Dex cartridge based on my average usage which might consist a journal entry and a couple of lists or notes per day. The cartridges are fairly cheap for a pack of 6 so I'm happy to keep my Dex in business. When the ink dries it will look a couple of shades lighter than it does when it was first placed on the paper. On a couple of my notebooks the ink feathered a little but it's to be expected with wetter inks. It's a matter of finding which paper best suits my pen and using the same notebook every day is boring anyway. Ink drying times averaged at about 5 seconds across most of my notebooks. The Dex has a habit of making a very odd squeaky/squelchy sound at times. It is only noticeable if there is no background noise. I'm not sure what causes the sound so if any of you have a squeaky pen and you know why it squeaks I'd love for you to get in touch and enlighten me. I'm always willing to learn where pens are concerned. When the pen is not in use I would recommend storing it upright. I returned to my pen after leaving it laying on my desk for a couple of hours, popped off the lid and sprayed ink everywhere. I should have engaged a bit of common sense. The ink is very wet and runny in the cartridge and quite wet when it's first applied to paper so it makes sense that it would leak. I thought I'd mention it so that none of you end up wasting precious ink needlessly. 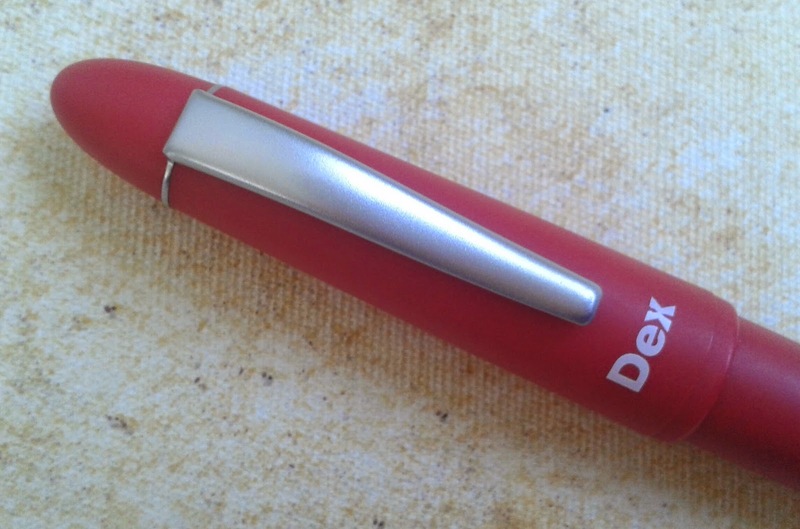 The clip on the Dex is a good sturdy clip although if I do take the pen out of the house I will try and make sure it stays clipped in an upright position just in case. The Dex is pen that demands respect and wants to work with you rather than for you. If you store it correctly, apply the correct amount of pressure and give it quality paper to sink it's ink into the Dex will do it's very best to provide you with an enjoyable writing experience. If you carelessly leave the pen lying around or expect it to do all the hard work for you it will certainly teach you a lesson. I love using this pen for my journal entries. It's a place where I can write whatever I want, experiment with my handwriting styles and really get lost in my own thoughts and just enjoy using my Dex. Once again, Thank you to The Pen Shop for providing me with this pen. It is definitely a pen I will reach out for when my handwriting takes a nose dive and I need a crash course. Despite receiving the pen for free all opinions in this post are entirely my own and I have not been influenced in any way. This is the Zebra BE-a AX5 formally known as the Zeb-Roller AX5. It's the same pen, just with a new and more complicated name. 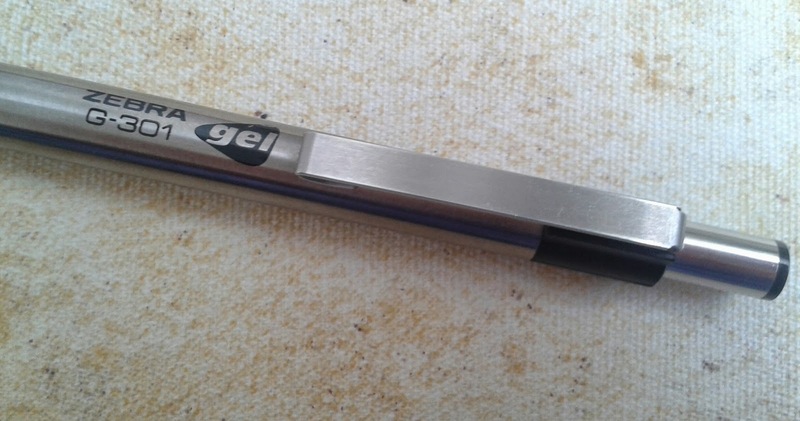 The entire pen is made from plastic apart from the clip which is metal. At first sight I wasn't blown away by its appearance. It's not a pen I could imagine myself looking twice at if I saw someone using it or at least it wasn't until I got it home and had a closer look. 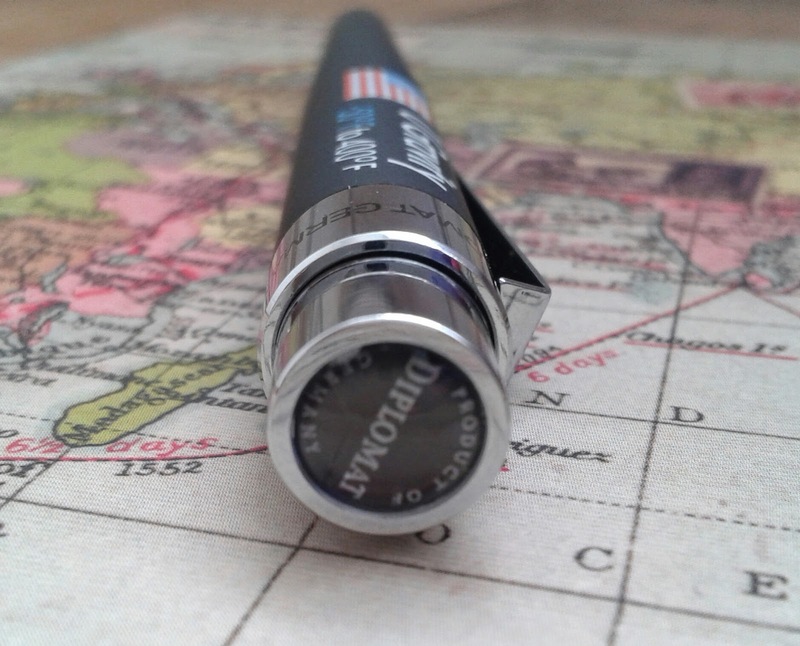 I'm generally of the opinion that if a pen writes well it doesn't really matter what it looks like but as I'm not just a user of pens but also a collector of pens I can't help but want it to be good looking as well as good at it's job. So I'm looking at this pen and as I examine the lid I notice something. It's a shark. Do you see it too? Or am I just a crazy lady? So we've established that it's a shark but is it friend or foe? Let's get reviewing .. 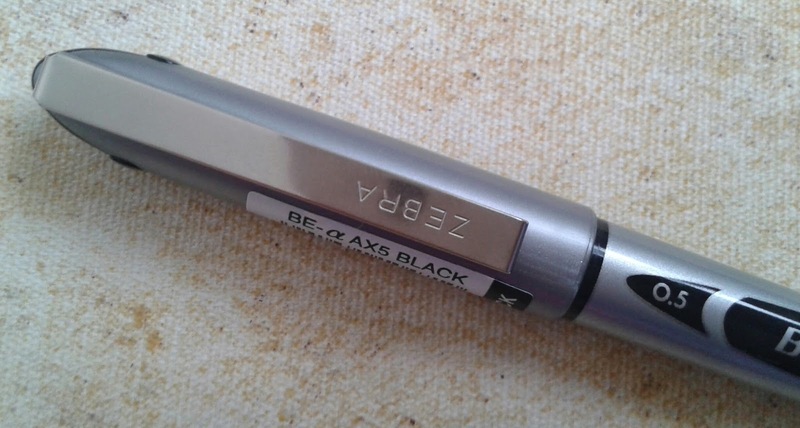 The plastic body of the Zebra BE-a AX5 is extremely light. Many pages of my notebooks have been filled with this pen and its light weight allows me to carry on writing forever if I want, never feeling the need to tighten my grip and without the need for regular breaks to stretch those aching fingers. The smooth plastic grip area dips in slightly from the barrel and although there isn't a grip as such, it doesn't matter. My grip of the pen is the perfect distance from the tip giving me complete control at all times without slipping or having to readjust. I'm loving the 0.5mm tip which gives me a 0.3mm line. I find my handwriting halves in size when I use this pen, because I can, I know the pen can handle it. The lettering is clear and readable even with tiny handwriting. No need for a Specsavers appointment just yet. I managed to get a quiet moment for a scribble session and noticed the lovely scratchy sound it makes when I write. I say lovely because although it sounds scratchy it feels amazing. The pen takes to paper like a fish to water, moving across the page effortlessly. Smooth but providing me with that tiny bit of resistance, just the way I like it. The liquid ink just keeps flowing, never giving up, never letting me down. The appearance of my handwriting differed slightly depending on the paper I used. 80gsm paper gave the best results. I was able to produce clear, fine lines,with no feathering. The 100gsm notebook I used for the sample caused the hairiness that you may be able to see in the picture. That's one of the reasons I love to have plenty of different notebooks at hand. I'd hate to dismiss a pen for one poor performance in one notebook if it behaves perfectly well in all the others. This is not a refillable pen. I much prefer a pen I can use again and again. It's the small signs of wear and the familiar feel that make the pen truly mine. Once I've had a pen for a while I can usually tell my own pen from another identical pen. So to let it go, accept it's no longer any good to anyone is a shame. Something look odd to you? The clip made me chuckle. The Zebra lettering looks like it's upside down. It never matches up with the wording on the barrel unless the lid is posted which it does nicely by the way. I felt like I'd found an undated 20p coin, a rare design flaw, but a quick search on google images made me realise they are all the same. The clip keeps my Zebra BE- a AX5 safe and sound so at least I can be assured that although the pen won't last forever, I won't be parted with it accidentally or otherwise before that dreaded day comes. I like this pen. It writes well on most paper, it feels great to use and it's quirky even if it's not immediately obvious. So now when I see someone using this pen I will look twice, maybe even three times, and then I'll scurry away before I get the urge to scream "Shark! ".